How Much Money Could I Make with My Web Idea? 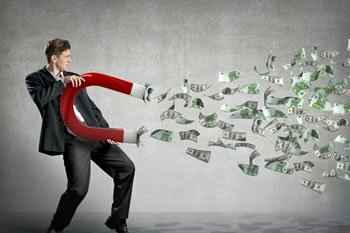 Home » Resources » Web Development » How Much Money Could I Make with My Web Idea? Never before has the bar been this low to be able to start a business venture and potentially make a fortune, and all without massive capital outlays. The internet and mobile devices comprise the foundation for a communication infrastructure that has connected us all and transformed the way we do everything. This platform has made it possible to introduce innovative ways of connecting and doing business and that has allowed many aspiring entrepreneurs to achieve financial independence in a relatively short amount of time. Stories abound of individuals and businesses who harnessed the wide reaches of the internet and applied this power to earn riches. That’s not to say that every idea is marketable or will succeed, however significant profits can be obtained with some business acumen, a lean startup mentality, experimentation, a little luck and partnering with a highly skilled team. Can You Make Money Starting a New Web Service? While the advent of the internet has led to the creation of many different ways to earn income, perhaps the most lucrative option is in the area of “Software as a Service” (SaaS), which will be further detailed below. Consider how many types of software you utilize on a day-to-day basis. Web-based software allows us to monitor our bank accounts, order food, read the news, connect with friends, sign documents, and even search the web. These web services have become an integral part of our lives, and our dependence will only continue to grow; in reality, the demand will only increase for services that help us save time, improve communications, and connect with one another. From an entrepreneurial perspective, SaaS-based business are very compelling. While the development of such businesses does require an initial investment, the costs are generally lower than most traditional businesses and the potential upside exceeds what a traditional business could hope for. With the web, you can reach a global audience, unrestricted from geographical barriers. And once the platform is created, the incremental cost of servicing additional customers is quite a bit lower than that of having to build out offices, equipment, staffing and all the other realities of a traditional business. This is the powerful draw of SaaS for those who are hoping to reinvent themselves and bring their idea to market. What exactly is SaaS? And how can it be used to make money? The concept of SaaS is simple: it’s a rental business model, where subscribers pay a fee (often monthly) to rent software or gain access to online information and services. These types of services are present everywhere. Finally, there are companies who organize around the idea of offering everything for free and with the goal of growing their community large enough so they can sell their web property to an interested party for millions or even billions. These concepts, along with many others note mentioned here, are represented well within the top SaaS companies in use today. Each of these SaaS companies likely uses one of the fee structures described above to generate revenue. Take LinkedIn: this popular networking website follows the freemium model. Users have access to a limited amount of services without being required to pay, although paying a fee opens up the door to the full range of the software. Naturally, it takes a solid idea, flawless execution, great marketing and some smarts to achieve success, but it doesn’t always take a significant amount of time. For example, while Microsoft took 12 years to reach a valuation of $1 billion, Amazon achieved this same feat in only 4.5 years, while relative newcomer Slack did so in only 15 months. These may seem like the billion-dollar unicorns and outliers, but in reality the list of both successful and influential software companies earning millions and tens of millions continues to expand each day. Let’s take a look at a simple subscription example to see how these earnings shake out. A few simple calculations will show you just how much money a SaaS company can make per month, depending on how much they charge and how many users they have. Starting small, imagine a SaaS business that charges $10/month per user. Obtaining 1,000 users, which is not an impossible task, amounts to $10,000 per month. Going further, consider another company that charges twice that; the same 1,000 users now generates $20,000 per month. Most people are astonished at the potential when they start doing the math. While these numbers may seem astronomical, they actually represent realistic revenue paradigm for a SaaS business. As new users are added each week and each month, revenues grow incrementally and the possibility for servicing large numbers of users inexpensively leads to the possibility of remarkable profits. Got a Great Idea? Take the Next Step! Without a plan, most ideas are nothing more than dreams. But with our help, we can help you turn that dream into a reality. Since 2003, we have built thousands of web projects for customers throughout the United States, and we have a proven method that guarantees you achieve the result you’re after. We offer end-to-end solutions, including design, development, launch and marketing advice. Are you interested in moving forward with your business idea? We are happy to provide a free 30-minute consultation to discuss your project, during which we can give you expert insights, provide a tailored approach, and explain how to drastically reduce your risks throughout the process. Don’t hesitate to request a call today. This entry was posted in Mobile Apps, Web Development and tagged Web Development. Bookmark the permalink.